According to a recently released report, from the “liberal” (as described by Crain’s New York Business) Institute on Taxation and Economic Policy, New York may have the highest state and local tax burden in the country but at least it has comparatively “fair” taxes with regard to the percentage of income paid by the rich, middle class and poor. So what about the taxes paid in New York by our two hypothetical couples, the Young Hopefuls and the Senior Voters? On their $80,000 in 2014 income the Young Hopefuls would owe $3,416 in New York State income tax and $2,115 in New York City income tax, according to TurboTax. Whereas on their $132,500 in income the Senior Voters would owe zero New York State income tax, and would have the city of New York actually pay them $125. Wait a minute? That is a “progressive” tax system? Perhaps it is, under the recent redefinition of the word, based on those who apply it to themselves. Just as a reminder, this is the third and last post in a series on taxes and generational equity in 2014. The posts compare the federal, state and local tax burdens of two hypothetical couples, the Senior Voters and the Young Hopefuls, using Turbo Tax and other information. The first post, which included a spreadsheet with the data for two couples, is here. A review of the federal tax burden followed. The federal government seems to have been captured by the rich and their lobbyists, along with older generations, and the tax code reflects that, with work income taxed twice and investment income taxed at a lower rate. In many places, in contrast, state and local government has been captured by public services producer interests, notably the public employee unions, and rising taxes and service cuts reflect that. So does the tax code. Here in New York, the reason that the Senior Voters would pay zero New York State and New York City income taxes (Turbo Tax says they would get a $125 city income tax refund) is that I made them retired public employees, and the pension income of retired public employees is fully exempt from New York taxes no matter how high it is, no matter how high total income is, no matter how young a public employee gets to stop working and never do anything for anyone else ever again. As a result of the pension exemption the New York State and New York City income tax codes treats the Senior Voters as if they were poor. And will continue to do so even once they start collecting Social Security and their total income rises to perhaps $200,000. Obviously this is something a “liberal” think tank would not want to talk about, given who is likely funding it, though their excuse is different. “State tax structures are notorious for treating elderly families very differently from other families and these differences cloud the incidence of state tax structures” according to the report. Or illuminate it, in my view. They seem to have avoided mentioning the state that exempts all public employee pension benefits at any age, along with Social Security, but treats private sector retirees less generously. New York. And funny how Illinois, which has been bankrupted by older generations, has exempted their pensions and other retirement benefits from its income taxes in order to make sure they are spared the resulting pain. No wonder Generation Greed wanted to kick the can, advance benefits, and push off costs. In addition to the full exemption of Social Security income, in New York private sector workers see $20,000 of their other retirement income exempted from state and local income taxes, but only after age 59 ½ (recently cut from age 62). That is, frankly, unfair compared with working age people who actually are poor, rather than just appearing to be because powerful lobbyists ensure some of their income doesn’t count for tax purposes. But New York’s deal for government pensioners is far richer than the deal for private sector retirees. Now let’s simply the chart in the first post in the series to focus on state and local taxes, excluding sales taxes. 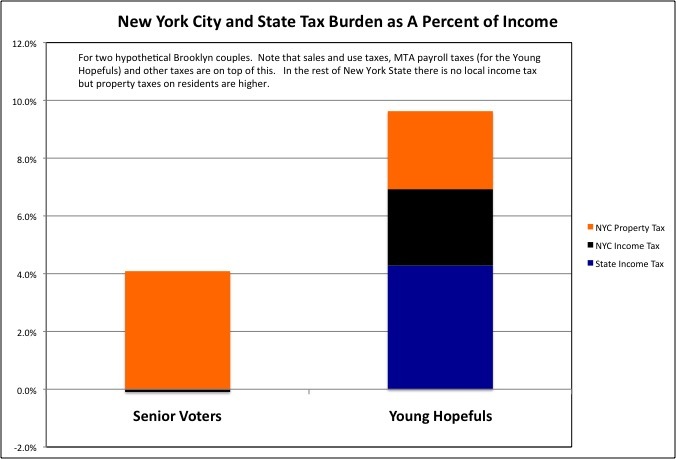 The data show that the Young Hopefuls would end up paying 4.3% of their incomes in state income taxes and 2.6% of their incomes in New York City income tax. Not including the 0.25% of wage income in the MTA payroll tax, which is nominally assessed on employers (and the self-employed). The Senior Voters would owe nothing, or less. The exclusion of public employee pension income from state and local income taxes in New York is longstanding. It is based on an amendment to the state constitution slipped though at some point in the distant past, one that says “The income of public employees shall be taxable except pensions.” Things have changed, however, from whenever that deal might have been snuck through. Public employment once featured low pay but secure pensions, and the tax exemption might have been considered part of the deal. In New York, however, the public employee unions have cut political deals for one retroactive pension increase after another for 20 years, even as younger generations of New Yorkers (the one percent aside) have become relatively poorer (as in the rest of the country). And public employee pay has increased as well, at least for certain categories, because if the public employees aren’t paid at least as well as similar private sector workers, their qualifications, motivation and work is simply reduced proportionally. All those retroactive pension increases, fraudulently described when they were even disclosed, represent a breaking of faith by New York’s public employee unions with just about everyone else. And the deals have left the New York City pension funds underfunded, particularly those for teachers, police officers and firefighters, leading to tax increases and service cuts. In this context the exclusion of public employee pensions from taxable income, and thus from any share of the sacrifices those pension increases have created, is very, very, very unjust. Just as unjust as the fact that at the federal level, as Warren Buffett pointed out, the average CEO has a higher marginal tax rate than their secretary. Senior Voters, whether retired public employees or otherwise, do pay property taxes. In New York City they would pay $5,415 in property taxes on their rowhouse in Windsor Terrace, Brooklyn, or 4.1% of their income. The Young Hopefuls would pay $2,160 in property taxes, or 2.7% of their income, as part of their $27,600 in annual rent, on their one bedroom apartment down the hill in Gowanus, Brooklyn. Adding it up, the Young Hopefuls would pay 9.6% of their $80,000 in income in New York State and New York City income and property taxes. The Senior Voters would end up paying about 4.0% of their $132,500 in income in these taxes. (Each would pay sales and use taxes in addition). Although they have lower income and a child, the Young Hopefuls would pay $7,701 in state and local income and property taxes. The Senior Voters would pay just $5,290. Moreover, property taxes are assessed on property wealth and not income, and the Senior Voters have much more of it. They live in a 1,500-square-foot house with an 800-square-foot basement that was worth $1.3 million, so their property taxes would be just 0.4% of their property wealth. The Young Hopefuls, with their child, are packed into a 600-square-foot apartment that was worth $198,000, so their property tax burden would be 1.1% of that property wealth, by that measure 2.6 times the burden on the Senior Voters. Advantaged in New York State, retired couples such as the Senior Voters are particularly advantaged in New York City. Elsewhere in the state New York’s nation-leading state and local tax burden is collected primarily in the form of very high property taxes. Take, for example, a house Zillow reports for sale in middle class Levittown New York, on Long Island. The 4-bedroom, 2 bath, 1,342-square-foot house is in some ways equivalent to the Senior Voters rowhouse, although since it is not part of the Brooklyn housing bubble it is offered for sale for just $389,990 – and estimated to be worth just $328,700. Its property tax level was $8,063, more than the Senior Voters pay on a house worth four times as much. Up in Scarsdale, this Zillow reports a 4 bedroom 4 bath house for sale $1,375 million, or a little more than the Senior Voters’ house was worth last year (New York City would claim the bubble price of $1.5 million for this year). The taxes on that house were $31,516 in 2013 according to Zillow, up from $23,816 in 2010. No wonder the public employee unions hate Governor Cuomo’s property tax cap. That’s a one-third increase in taxes in two years. Those kind of increases could pay for many more retroactive pension increases, even as those other than public employees went broke and faced foreclosure unless they were rich. If the Senior Voters lived there, the property taxes alone would absorb nearly a quarter of their income. The Young Hopefuls could not afford to live there even if they were given the house for free. (One reason some suburbanites like high property taxes – to keep the serfs out of their towns). 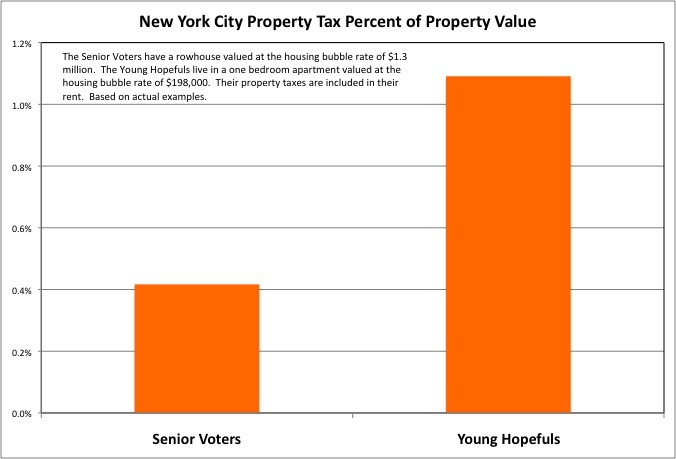 The property tax burden on the Senior Voters is relatively low, given New York City’s extremely high tax burden overall, for two reasons. First New York City has its own personal income tax and business income taxes, something virtually no other localities in the country have. These extra taxes pay for a substantial share of New York City’s excess local government tax burden, leaving its overall property tax burden about average as a percentage of its residents’ personal income. At least as of the last time I checked. (An update will be coming soon, based on the 2012 Census of Governments, after perhaps 100 hours of number crunching before I even get to write a post). Note that for workers such as the Young Hopefuls and private sector retirees, those average NYC property taxes are on top of that heavy NYC local income tax, but retired public employees don’t pay the income tax. If that doesn’t seem like too much of a limitation, consider when the law was passed. In the late 1970s the value of New York City’s property was at a low ebb, to the point where many properties were worth nothing and abandoned. Then the city started to recover. The cap was passed in the early 1980s, and prevented the assessed value of property from reflecting that recovery. This perk for homeowners was seen, by former Mayor Koch, as the equivalent of rent regulation for homeowners suburban parts of the city. Rent stabilization prevented long time tenants from being priced out of Manhattan, where the disparity between market and regulated rents is greatest. A limited assessment increases for 1 to 4 family homes kept middle class homeowners from being pushed out of suburban areas of the other borough by the property tax burden. It was seen as a way for the middle class to stay in their homes, at a time when middle class people had been fleeing. And it was seen as fair, because rent regulation, public housing and programs such as Mitchell Lama reduced the market value of multifamily housing, and thus their share of the city’s property taxes. But over time the effect of this law has become extreme. “Even though Class 1 properties’ market value is about 46% of the market value of all taxable property in the City, Class 1 taxpayers pay about 15.5% of the City’s property tax,” according to the city pamphlet. Multifamily housing, with 23.6% of market value, pays 36.75% of NYC property taxes. Commercial property, with 26.87% of market value, pays 40.91%. By this measure, if homeowners such as the Senior Voters were required to carry their pro-rata share of the property tax burden their property taxes would triple. Or more because some homeowners, including the Senior Voters, get a better deal out of the assessment income cap than others. Ironically the suburban areas of the city, Staten Island, eastern Queens, the southern rim of Brooklyn and the east Bronx, do not get the greatest benefit from this deal. Because at the time the deal was passed those areas were relatively stable, and their property values and assessments reflected that – so the limited increases started from a higher base. The big winners are gentrifying areas, such as “Brownstone Brooklyn,” where the state law locked in the low property assessments from the time when they were poor, declining, often redlined neighborhoods. That’s why a house on my street in Windsor Terrace could pay just $5,415 in property taxes on a house purportedly worth $1.3 million as a result of the latest housing bubble. Whereas a friend’s one family house in Douglaston, Queens, one allegedly worth $1.06 million in 2014, paid $12,136 in NYC property taxes, or more than double. In a still further irony, while the assessment limitation is intended to allow long time residents such as the Senior Voters to stay in their homes, they can cash in the value of that subsidy and take the proceeds with them to Florida. How? Let’s say the Senior Voters decided to sell their house, and a bunch of Young Hopefuls decided to try to buy it. To bid highest and get the house the bidders would have to stretch as far as their income and other expenses would allow. But the amount they could afford to pay in a monthly mortgage payment is affected by how much they would also have to pay in property taxes. So the property tax assessment break inflates the value of the Senior Voters’ house, and the amount of money they get to cash in while moving to Florida. The Young Hopefuls would end up paying just as much for housing as if property taxes were higher, but in higher mortgage payments rather than property taxes. (This works in reverse in Upstate New York, where high property taxes and heating and maintenance costs have caused the value of houses to plunge). For this reason the shift in the property tax burden, if a lawsuit against the state law limiting the assessments on 1 to 4 family homes were to succeed, would not be a great as the current shares of market value and property tax paid would imply. With lower property taxes as a share of real value, the market value of multifamily housing and commercial property would rise, limiting the decrease in their taxes. Rent regulated buildings, moreover, already have the net operating income on which their property tax assessment is based depressed by rent stabilization itself, and would likely see little decrease in taxes. On the other hand with higher property taxes as a share of real values, the market value of 1 to 4 family housing would fall, limiting the increase. Assessment is a circular process in which values depend on property taxes depend on values. Today, however, the Senior Voters don’t have to sell to move and keep the subsidy. They can take advantage of the property tax limitations designed to allow them to stay in their homes, move away, and rent the house out with no limitation on the rent they could charge. Rent it out like Mayor Bill DeBlasio. It’s kind of like tenants taking advantage of rent stabilization laws designed to help them stay in their apartments by moving to their summer houses in the Hamptons, and illegally subletting their apartments at market rates, keeping the difference between what they pay and the sublet tenant pays. Except that this isn’t illegal. It turns out that our state legislators are well aware of the breaks Senior Voters get on their state and local income taxes and NYC property taxes, and have sought to remedy unfairness. But not in the way a neutral observer might expect. To Assemblymember Peter Abbate, one of the mouthpieces of the public employee unions in Albany, since retired public employees don’t have to pay state and local income taxes fairness requires that they also shouldn’t have to pay property taxes either! His big idea, introduced year after year with lots of co-sponsors, is for public employee pension income to not count when determining eligibility for increased tax breaks under the state’s STAR program. As I mentioned at the outset of this analysis the Senior Voters qualify for the basic STAR tax break, but not enhanced breaks, because their income was too high. But if Abbate had his way, when they hit age 65 the exclusion of pension income would push their purported income below $83,300, allowing them an additional “enhanced” benefit of $400 more under STAR. And if they were smart and waited to collect Social Security until age 70, maximizing their monthly benefits, they would (from age 65 to 70) qualify for the Senior Citizen Homeowners Exemption for really poor seniors (income less than $37,400), and their property taxes would plunge further. This is a microcosm of what is happening in public policy in general. Many tax breaks and programs for seniors were put in place long ago, at a time when each generation was richer than the one before, and seniors were thus relatively poor. But after peaking with Generation Greed each generation has been poorer than the one before. So with the richest generations in or moving to retirement, you have these suggestions to allow them to pretend to be poor by pretending their income isn’t there. For their part, the State Senate Republicans have asserted that since public employees have their pension income fully exempted from state and local income taxes no matter how high that income is and no matter how young they retire, private sector retirees should get the same deal! Right up to former CEOs with pensions or other deferred compensation of $1 million or more per year. After all, they claim, seniors are leaving New York for places like Florida or South Carolina, and that’s bad for the economy. Now I understand why, in parts of the state with no local income tax and thus an extremely high property tax burden, retired people are moving away. Imagine a senior with no pension and just $200,000 in 401K retirement savings, which will be a common situation among the generations born after 1957 or so, facing a property tax burden of $15,000 per year. In less than 15 years the entirety of their retirement savings would be gone, even if they had spent all of it on taxes and none of it on themselves. But having seniors move away is definitely not bad for the economy. Here is a very brief description of the current state of local and regional economic development. Places that attract a growing share of young workers and entrepreneurs win, as in New York City. Places that young worker leave, leaving seniors and their burdens behind, lose, as in Upstate New York. Particularly given the categories in which NY governments spend so much more than other places, including pensions. And Medicaid for seniors. Should New York do right by its aging citizens who worked here and paid taxes here for decades, if they are also willing to continue contributing their fair share in retirement? Absolutely, and without question. But should anyone else care if they leave for Florida? No, not as long as they don’t come back when they run out of money and need extensive Medicaid-funded benefits. Given how much more than anyplace else New York state in general and New York City in particular spends on retired public employees, there no is justification for exclusion of public employee pension income from state and local income taxes. The state constitution should be changed to allow that income to be taxed, and if the public employee unions want to be in solidarity with other workers in any way, that is something they should support. After all, the increased revenues are needed for additional pension contributions and retiree health insurance. As a downpayment on that change, the Social Security income of retired public employees should be made taxable immediately. Private sector retirees would get the Social Security exclusion and an exclusion of the first $20,000 of their other retirement income, but public workers would get the full pension exclusion instead. One could argue that this is constitutionally required. After all, the state constitution says “The income of public employees shall be taxable except pensions.” And Social Security is a public benefit, not a pension. As for the property tax deal for 1 to 4 family homes, there is a significant difference between it and all the inequities and hypocrisies I have chronicled over the years. That deal benefits me, my friends and neighbors. Does that mean I can defend it to the death? Nope, I can’t, which is why I could never be a real politician (or lawyer or NYC union leader or mouthpiece of the one percent). In any event, nothing is likely to change unless the NY state courts force a change, because any change in this deal would be political death for anyone who proposed it. If the courts overturn the deal, would everyone in my neighborhood, and in 1 to 4 family homes throughout the city, be driven out by high property taxes when their income drops in retirement? Not if, as a replacement policy, homeowners were allowed to defer property tax payments in excess of 4.0% of their incomes until their house was sold, and a windfall was received. And if the housing bubble deflated and that windfall was diminished, past property taxes were recalculated as if the bubble had never inflated to begin with. The same policy, with the option to defer property taxes in excess of say 7.0% of income (in places with no local income tax), could work in the rest of the state too. And once the jolt of a full share of NYC’s excess tax burden hit NYC homeowners, perhaps there would be support for apply Governor Cuomo’s property tax cap to the city as well. For now, it seems that our political system, dominated by Senior Voters, the Executive/Financial class and the Political/Union class, has no conscience and knows know limits with regard to the future of the Young Hopefuls. And not just with regard to taxes.